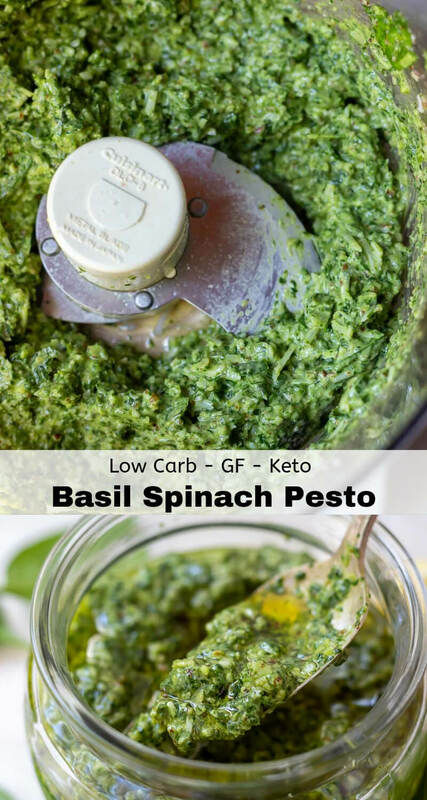 This Basil Spinach Pesto Recipe is perfect for anyone that prefers a mild basil flavor or is following a low carb diet. 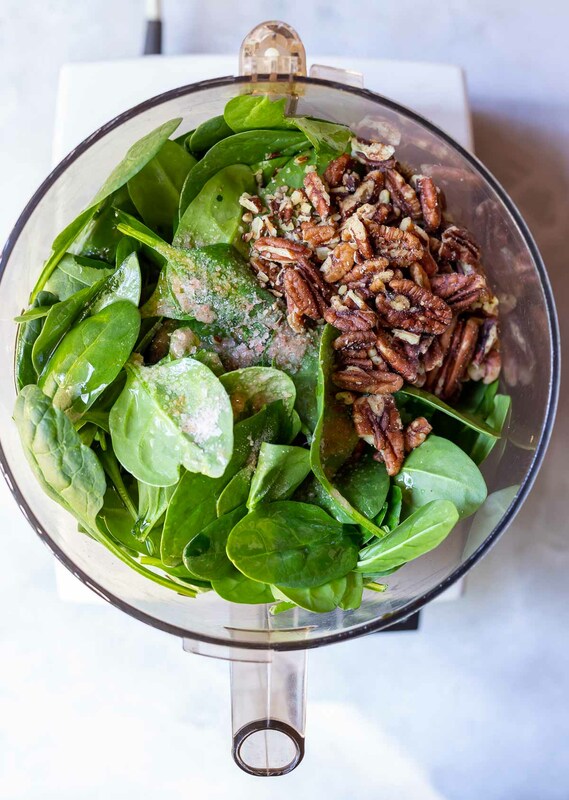 This Keto Pesto is made with pecans, one of the most Keto friendly nuts. If you don’t care about carbs, you can bet that this pesto also tastes amazing! I do love traditional pesto with its bright basil flavor. 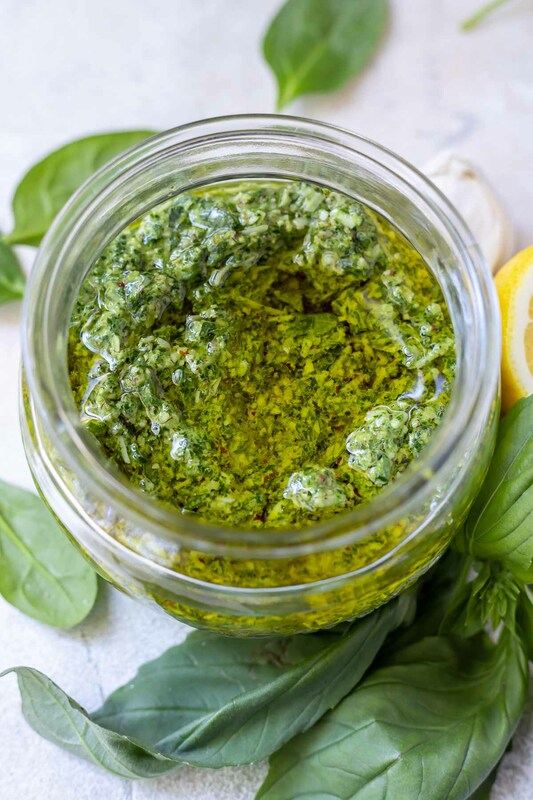 But this Spinach Basil Pesto is a great way to enjoy a more mild version, while getting a double punch of nutritious spinach. 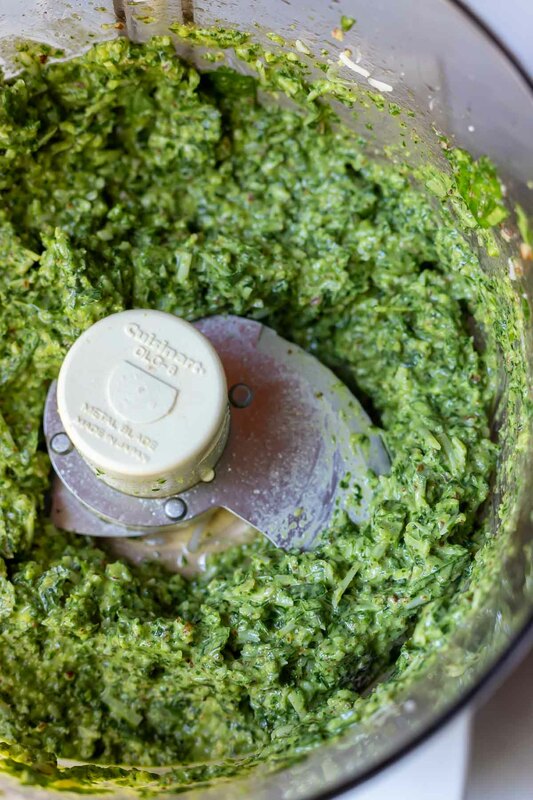 The best part about making homemade pesto is how quick and simple it is. You literally just toss the ingredients into a food processor or blender and pulse it to your desired consistency. Then slather it on everything! Pesto is great for you! It has healthy fats, protein from the nuts and this pesto has the extra nutrients thanks to fresh baby spinach. As far as a sauce or condiment, it doesn’t get much better than pesto. Traditional pesto includes fresh basil, garlic, olive oil, pine nuts, grated parmesan and salt. This pesto recipe trades the pine nuts for pecans and subs most of the basil for spinach. I also like to add a squeeze of lemon. If you’re not a fan of basil at all, feel free to use only spinach. Combine spinach, garlic, lemon juice, salt, oil and nuts in food processor or blender. Pulse several times until mixture is a chunky paste-like consistency. Scrape down the sides. Add basil and parmesan cheese. Pulse just a few times to break up the basil leaves. Add more oil if a thinner consistency is preferred. Transfer pesto to glass container. Top with olive oil and refrigerate to store. Pesto is great with pasta, meat, vegetables or even used as a dip. 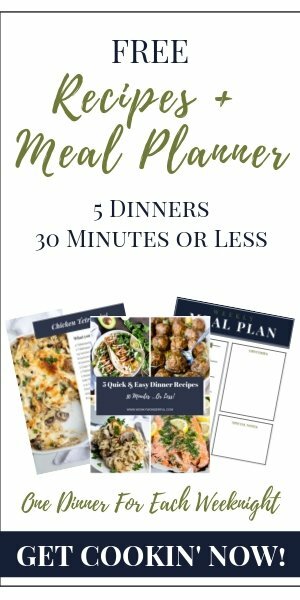 Here are a few recipes that would be fantastic with the addition of pesto: Lemon Butter Chicken Thighs, Cast Iron Flank Steak, Oven Roasted Potatoes or Parmesan Roasted Cauliflower. 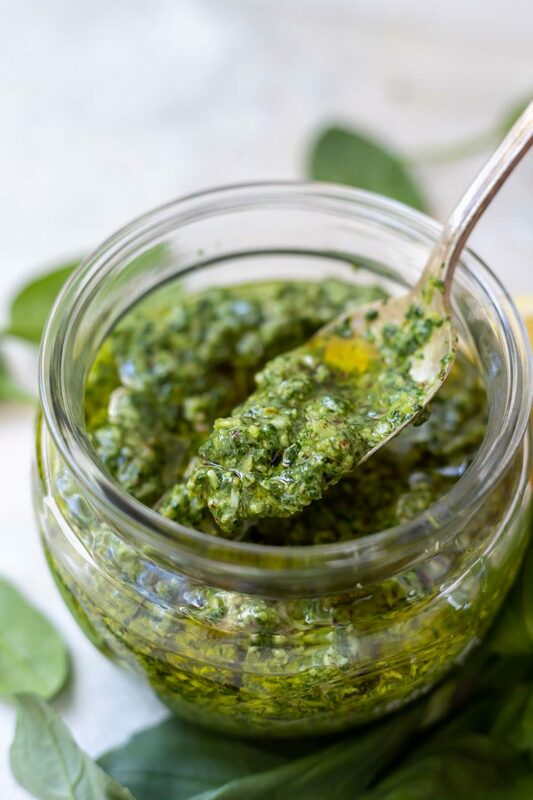 If you’re looking for another fresh and tasty homemade sauce, try this Garlic Cilantro Chimichurri Sauce. 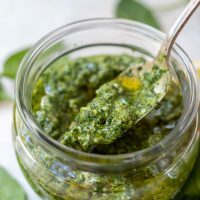 This Basil Spinach Pesto Recipe is perfect for anyone that prefers a mild basil flavor or is following a low carb diet. This Keto Pesto is made with pecans, one of the most Keto friendly nuts. If you don't care about carbs, you can bet that this pesto also tastes amazing!